It’s Tuesday, and that means the release of the ebook edition of Endangered Memories, the first volume in my Expired Reality series! It’s available for only 99 cents on your Kindle, Nook, Sony Reader, etc, and will be available in paperback through Createspace very soon. To celebrate the release, those of you who follow this blog can grab a free copy of Endangered Memories today in whatever ebook format suites your fancy. Just head to Smashwords via this link – http://www.smashwords.com/books/view/65576 – and enter code – MK55C – during checkout to get your free copy. This code is valid for today only, so grab the book while you can. On top of the free copy of Endangered Memories, I’m also revealing my new website facelift today. Head over to – www.davidnalderman.com – and let me know what you think! 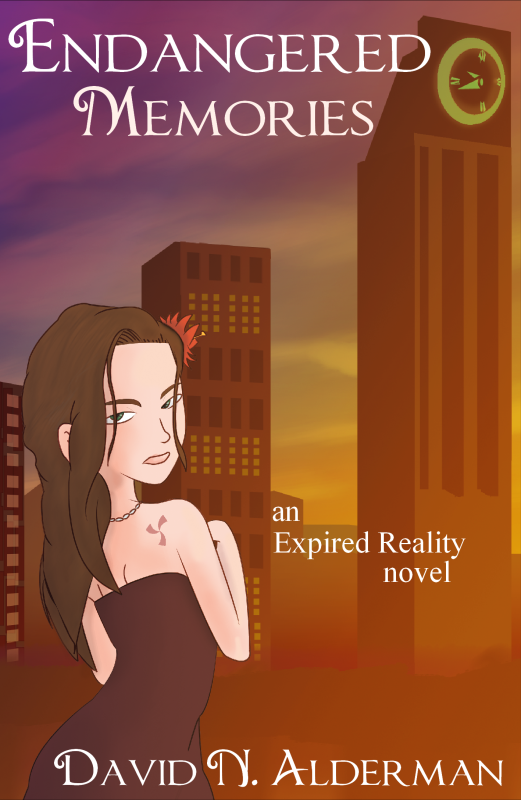 And so, without further ado, here is Endangered Memories, the first novel in the Expired Reality series…. When ex-hero David Corbin receives an unexpected wedding invitation from the girl he once loved, he sets out on a journey to South Ryshard to crash the event and proclaim his true feelings to her. With help from his close friend, Veronica, and a girl named Kimberly, David battles his way through crooked agents, a crazed farmer and a demon hybrid to reach the wedding on time. Only when he runs into Turquoise, a mysterious woman on her own mission to stop the wedding and procure an enchanted timepiece, does he realize that the fate of humanity hangs in the balance. Carrie Green is days away from marrying Jerad Montlier, one of the richest men in the world. Lacking any memory of her past, and displaying a peculiar spiral birthmark on her shoulder blade, Carrie is spun into further confusion when a diary with her name on it falls into her possession. Reading the entries inside sparks a recollection of her past and reveals the horrifying trap that’s been set. As heroes’ paths collide, the beginning of the end launches in this epic first volume of the Expired Reality series.